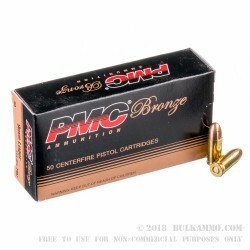 PMC Bronze offers clean, accurate range shooting at a reasonable price. 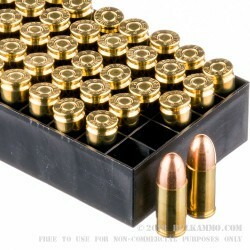 This box holds 50 9mm Luger cartridges. This particular loading uses a lighter 115-grain bullet and generates a muzzle velocity of around 1150 feet per second. 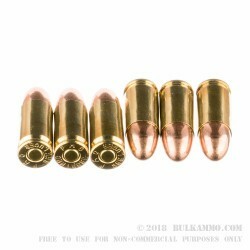 All PMC Bronze ammo comes in new, boxer-primed reloadable brass. Although a relatively new entrant to the US market, PMC’s range ammo has rapidly gained popularity among American shooters for its moderate cost and solid shooting characteristics. The company behind PMC, the Poongsan Corporation of South Korea, is a highly experienced manufacturer of munitions that has handled South Korean military ammo contracts since the late 1960s. As a major contributor to South Korea’s national defense, Poongsan takes great care in producing its ammo for reliable ignition and ballistics. Electronic quality inspections and internally sourced components ensure that each batch of PMC ammo matches the performance of the last. nice, reliable 9mm for an old military pistol. Great shooting ammo. NO FTF and feeds well. I'll be back for more!